WE'RE ON THE VERGE OF SOMETHING BIG! The Rutherford Challenge has been met!!! Generous individuals and businesses in our community have given their support to the MHS Band program and helped us meet the goal of raising $15,000. At this time, $15,090 has been donated (but feel free to keep adding to this amount if you like). Our thanks to William Rutherford for encouraging us to meet this challenge grant and for his financial support of the band program! I don’t suppose I really need to recap last Thursday’s Band Concert since you were probably there, but I will say that the bands are sounding exceptionally good. It’s a pleasure to hear how far they have come in just a few months. Since I forgot to bring a real camera to the concert, I’ll include a couple pictures taken from my phone. If you have any pictures you’d like to share, please visit the Share page at the Mac Band website and upload them there. The Duniway concert will be on Wednesday, May 30th at 7:00 p.m. in the Duniway Gym and will include all Duniway music groups. The Patton concert will be on Thursday, May 31st at 7:00 p.m. in the Patton Gym and will include all Patton music groups. 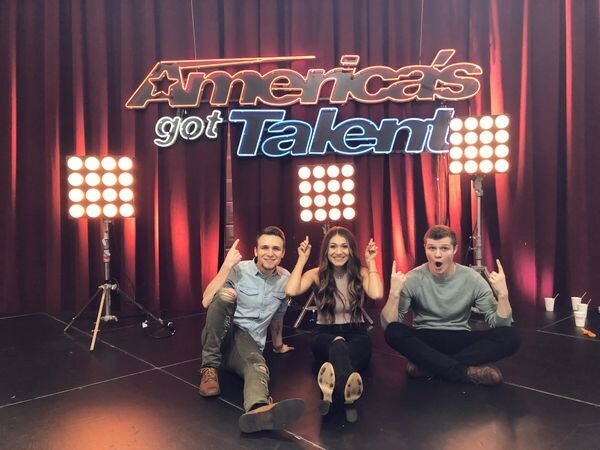 This Tuesday, be sure tune in to NBC at 8:00 p.m. for the season premiere of America’s Got Talent. Why? Because MHS Grads Joshua Humlie, Bethany Blanchard and Manny Humlie will be performing! Now known as We Three, this talented family will be sharing their music with the whole country. Click the Golden Buzzer preview, and you can get a quick glimpse of them 50 seconds into the video.